So you want to convert your texts and documents to mp3 audio. With the use of this trick, you can do it easily. 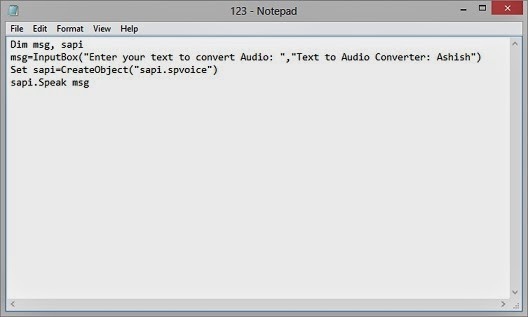 Follow these steps to convert text file into audible sound. Few days earlier, when I was creating a video for my YouTube channel I found it really interesting to add a sound clip narrating the user seeing the video. After lots of searching, I found two ways to convert text into mp3 sound. You can easily do it without any hassle. You'll also like to know how to add image cover in songs. You can use any text and this trick will narrate it. If you will use the first method than you will require Notepad (preinstalled in your OS) and a sound recorder that will record the audio for you. Second method is very easy, you will use Google Translate API to convert texts and characters into mp3 sound. The sound will be heard like the human voice and you will be able to understand it very easily. Getting excited to know this cool trick? Just keep reading and explore the trick. As I said first will require you to open Notepad. In this method you will be creating a small program that will convert text into audible sound in human voice. You can record the sound clip if you like. Let's now see the trick. First, open Notepad and add the following code on it. Now click on File located in the top left corner. After that click on Save As. Choose All Programs from the Save as Type drop down. Save the file as VBS format. 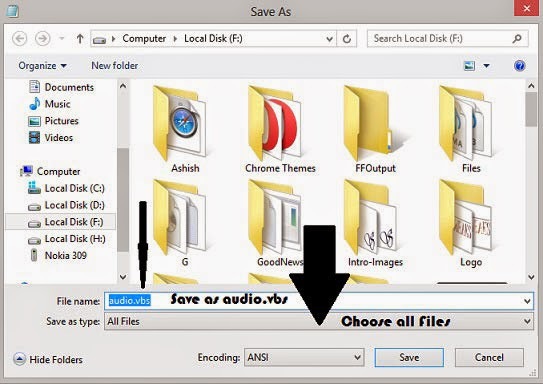 Just name the file audio.vbs and click Save button. Now locate the folder where you saved this file (audio.vbs file if you're following this tutorial). Double click the file to open it. Add your text in the available text area and click OK.
Now your Computer will read the written text for you. If you're not able to record the audio from the small program created using Notepad than follow the second method. This method is much easier. In this method, we will use Google. You will only need to write your text in the URL and you will get that text and word as a mp3 file. Looks complicated? I will explain you how to do this. I will also tell you how can you insert a Form or Input box in your site to make easy to convert any text into audio. Let us first know how to convert your text file into audible mp3 sound using Google API. Take a look at the URL below. We will use the above given URL to convert our text file into audio. If you want to see the demo than go to the above given URL. After going on the above web address, you will get an mp3 file which contain the sound clip saying Hello World. Now lets know how to use this to convert our own text into audio file. Take a look at the URL again. Replace the text highlighted with red color with your own text. The Blue Plus (+) is for space. If you want to convert Welcome to Spicy Tweaks into mp3 file than you will add the text as welcome+to+spicy+tweaks and after that load the URL in your browser and mp3 file containing the text converted into audible sound. That's It! If you followed the above steps carefully than you should have converted your text file into audio sound. Note: You can only use 100 characters in the Google Text to Audio API. There are many other ways to convert text to audio file. Search for it on Google and you will find one which is little better than this one. If you want to add an Input box in your website or weblog than use the following code. Finished! I hope you're enjoying this trick to convert any text into audible mp3 sound. If you need any help than feel free to drop a comment below. Keep visiting for more tricks. You can also subscribe to our free Newsletter. 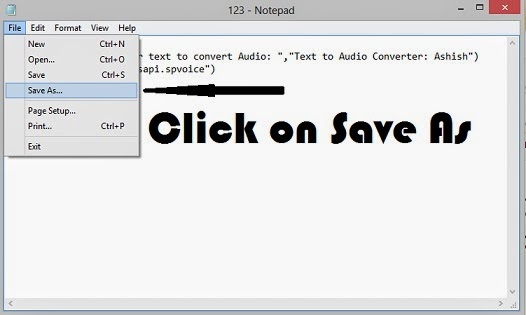 --->>How To Convert Text into Audio by Notepad Trick!! Copyright © 2017 SpicyTweaks - All rights reserved.